One of the most omnipresent electric components is the resistor. In applications where variable resistance is required, potentiometers and rheostat are mostly preferred. We have already discussed about potentiometers in our previous article about the same. Here we shall discuss about rheostat in detail. Rheostat is a type of variable resistor, whose resistance can be changed so as to change the amount of current flowing through a circuit. This device, was named â€œRheostatâ€ using two Greek words â€œrheosâ€ and â€œstatisâ€ (meaning a current controlling device), by an English Scientist Sir Charles. It has two terminals, out of which one is fixed and the other one is a moving terminal. Some rheostats have three terminals just like potentiometer, although only two terminals are used (Only one of the two fixed terminals and the moving terminal are used). Some practical rheostats are shown below. 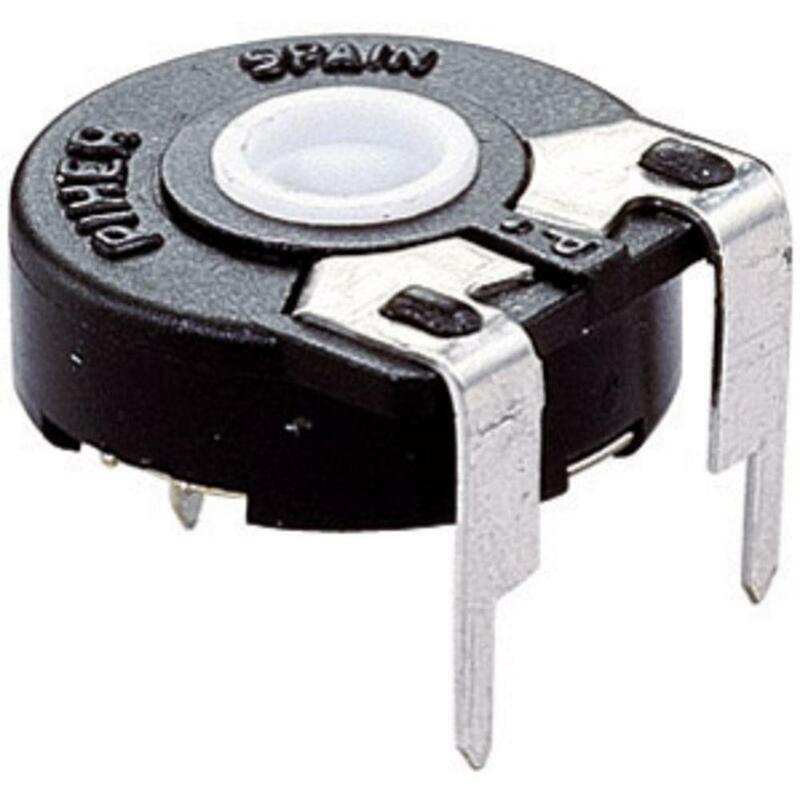 Unlike potentiometers, these devices have to carry significant amount of current. Hence, wire wound resistors are mostly used for the construction of rheostats. In a circuit diagram, a rheostat is often represented as shown below. So on what basis does the rheostat work? Letâ€™s get to know that in the next section. In order to understand, the significance of rheostat and its working principle, let us refresh our basic of electric circuits. 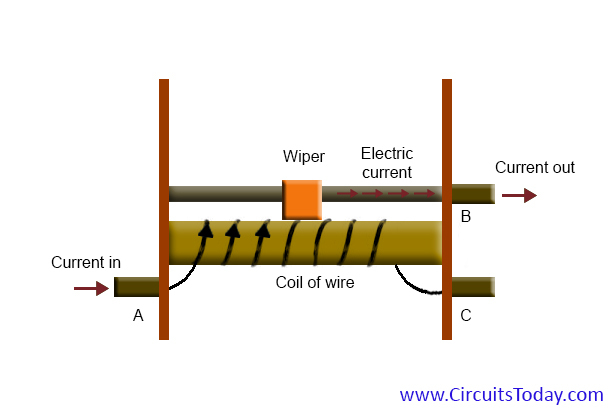 The three main parameters of an electric circuit are: voltage applied to the circuit, current through the circuit and the resistance offered by the circuit. Now, we know these parameters are interdependent. That is, to change the current, we can either change the voltage applied or change the resistance of the circuit. When we use a rheostat in a circuit, what we are basically doing is changing the resistance of the circuit, to change the current. As the current and resistance are inversely proportional, if a decrease in current is required, we will increase the resistance of the rheostat. Similarly, if an increase in current is required we would simply decrease the resistance of the rheostat. Now you may wonder whether there is there a maximum limit up to which the resistance can be decreased or increased in a rheostat. The answer is yes, there is. For every rheostat comes with a resistance rating, like for example if a rheostat has a rating of 50KÎ©, the minimum resistance it can offer is 0 and maximum is 50kÎ©. So how do we change the resistance of the rheostat? For this, rewind your basics of resistance. In our previous article â€œResistivity and Electrical Conductivity – Complete Guideâ€, we have discussed the parameters on which resistance of a material depends. Â The main three factors on which the resistance of a material depends is its length, area of cross-section and the type. Here, in this device, the effective length is changed using a sliding contact. A rheostat as already mentioned has a fixed and a moving terminal. 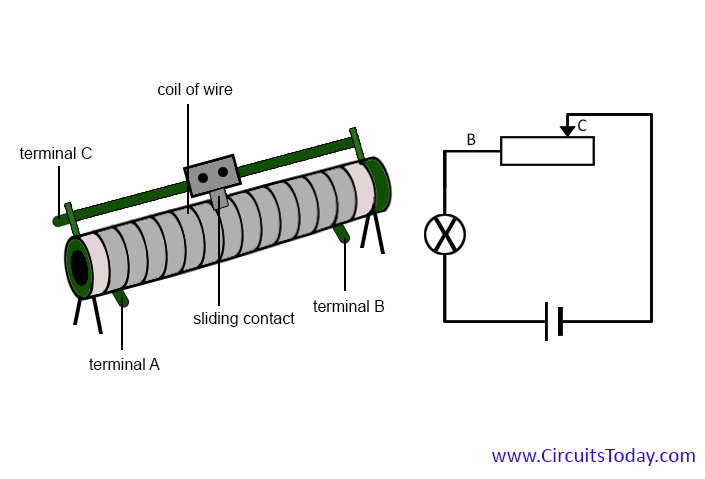 The effective length is that between the fixed terminal and the position of the sliding terminal on the resistive path.Â As the slider moves, the effective length changes thereby changing the resistance of the rheostat. Since resistance is directly proportional to the length, as the effective length increases, the resistance increases. Similarly, as the effective length decreases, resistance offered by the rheostat decreases. Now that the working principle is quite clear, letâ€™s see, the construction and types of rheostats. 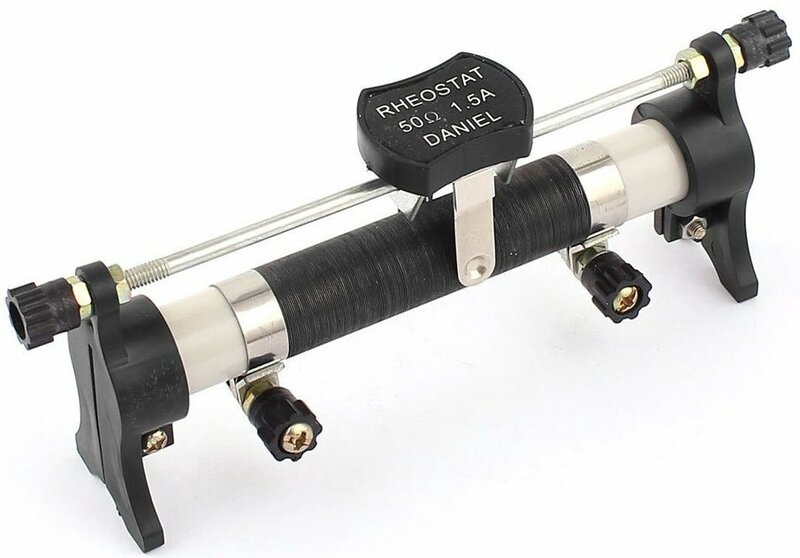 The construction of rheostat is same as that of a potentiometer, as discussed in detail in our article about potentiometers.Â Similar to the potentiometer, a rheostat has three terminals, two fixed and one moving. Also, this moving terminal slides over a resistive path. This resistive path can be of any type of resistive material such as carbon composition resistor, wire-wound resistor, conductive plastic resistor and ceramic resistor. The choice of type of resistive material purely depends on the type of application. However, in most of the applications these rheostats tend to carry significant amount of current and hence in these cases wire wound resistive path is chosen. Also the geometry of the resistive path can be either rotary or linear. Based in the geometry of the resistive path, we have two main types of rheostats, namely rotory rheostats and linear rheostats. Apart from these two there is another type of rheostat, named as trimmer. These rheostats have a linear resistive path. The sliding terminal glides over this path. There are two fixed terminals however only one of the two is used. The other terminal is connected to the slider. These are mostly used in laboratory applications. Mostly wire-wound resistive path along a linear cylinder shaped material, is used. 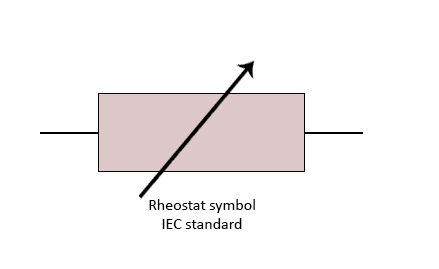 The following figure shows a typical linear rheostat. With full justice to its name, a rotary rheostat has a rotary resistive path. These are mostly used in power applications. These rheostats have a shaft on which the wiper is mounted. Wiper is nothing but the sliding contact for a rotary rheostat, which can rotate over Â¾ of a circle. The function and working principle are all same for both types of rheostats. The figure below shows a rotary rheostat. When rheostats are used in a printed circuit board, they are used as trimmers or preset rheostats. Trimmers are nothing but a small rheostat, mostly used in calibration circuits. Two terminal trimmers are available, although in most cases three terminal potentiometer trimmer is used as a two terminal rheostat. The figure below shows a trimmer. We see that rheostat and potentiometer share same construction. 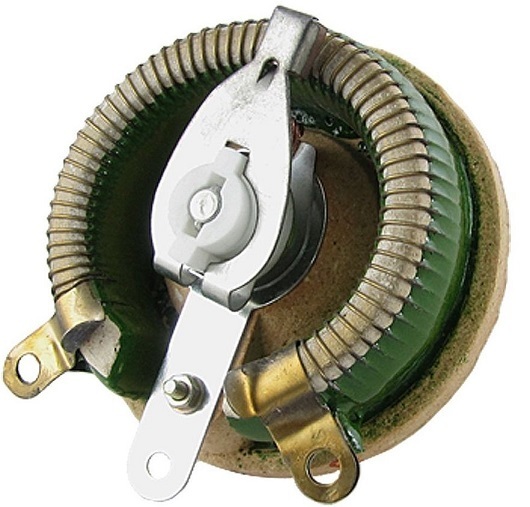 You might wonder can a potentiometer be used as a rheostat. Yes, it can be wired as rheostat. Let us see how. We see that a potentiometer has three terminals, two fixed terminals and a moving terminal. A rheostat also has the same, although it uses only one of the two fixed terminals. So wiring a potentiometer as a rheostat is fairly simple. All you have to do is connect a fixed terminal and the moving terminal together, such that it acts like a single moving terminal. Thus what you have now in effect is a fixed terminal and a moving terminal. Instead of being a voltage controller, the potentiometer will work as current controller or a rheostat. This way you can use a potentiometer as a rheostat. Therefore, it is a common practice to wire a pot as a rheostat. 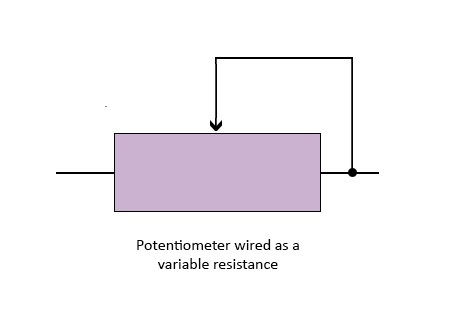 The figure below shows the schematic representation of a potentiometer wired as rheostat. Speed control circuits for motors, heaters and ovens. Since they dissipate heat, they have low efficiency and hence are now being replaced by pulse width controlled switching devices. Preset rheostats or the trimmers are used during calibration or circuit tuning. In case two terminal trimmers are not available, a three terminal trimmer potentiometer is wired as trimmer rheostat. With this, we come to the conclusion of the article. Letâ€™s have quick look about the rheostats. Rheostats: A Quick Look Back. Rheostats are a type of variable resistors. Mostly they are three terminal devices but only two of these three terminals are used. Three terminals include two fixed terminals and a moving terminal (called a slider or wiper). Out of the two fixed terminals only one is used. As the slider moves over the resistive path, they change resistance in circuit and hence control the current in the circuit. They look like a potentiometer, although they both are used for different applications. A potentiometer is used to control voltage in a circuit while a rheostat is used to control the current in the circuit. The construction of a rheostat is same as that of a potentiometer. It has resistive tack, which is either linear or rotary. The types of rheostats include linear, rotary and trimmer rheostats. A trimmer rheostat is used when these devices need to be included in PCBs. The rotary and linear rheostats are used in power applications and current limiting applications. A potentiometer can be wired as a rheostat by simply connecting on its fixed terminals with the sliding terminal. So in areas where a rheostat is not available, a potentiometer can be wired in this way and used as a rheostat. Found your post interesting to read. Nice collection of pics, it makes article more interesting. Good luck for the upcoming articles.